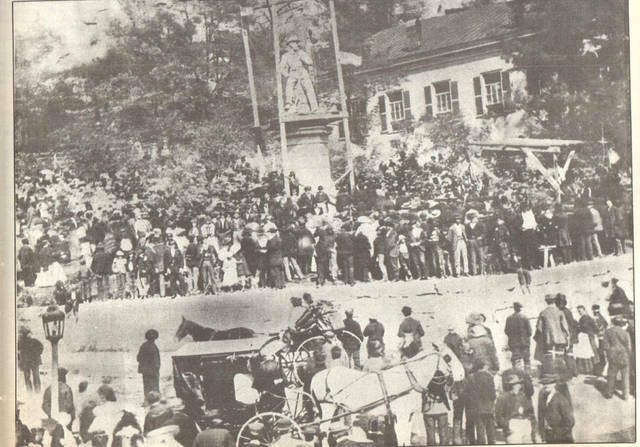 This photo, which appeared in the 175th anniversary of Meigs County edition of The Daily Sentinel in 1994, shows the crowd gathered at the Meigs County Courthouse in Pomeroy for the 1871 dedication of the Civil War Soldier Monument located next to the courthouse. The monument still stands on the Mulberry Avenue side of the courthouse as a reminder of the sacrifice of Meigs County residents who fought and died in the Civil War. According to article accompanying the photo in the anniversary edition written by Jim Freeman, in March 1870, the Meigs County Board of Commissioners, upon the petition of county residents, dedicated all of the ground lying west of the courthouse between the courthouse and Mulberry to the “sacred purpose of erecting a monument to the memory of the soldiers of said county who died in the service of their country during the great rebellion.” The monument was completed in October 1871, with the dedication and unveiling taking place on Oct. 17, 1871 with an estimated 2,500 people in attendance. https://www.mydailysentinel.com/wp-content/uploads/sites/14/2018/07/web1_7.27-TBT_ne201872513550199.jpgThis photo, which appeared in the 175th anniversary of Meigs County edition of The Daily Sentinel in 1994, shows the crowd gathered at the Meigs County Courthouse in Pomeroy for the 1871 dedication of the Civil War Soldier Monument located next to the courthouse. The monument still stands on the Mulberry Avenue side of the courthouse as a reminder of the sacrifice of Meigs County residents who fought and died in the Civil War. According to article accompanying the photo in the anniversary edition written by Jim Freeman, in March 1870, the Meigs County Board of Commissioners, upon the petition of county residents, dedicated all of the ground lying west of the courthouse between the courthouse and Mulberry to the “sacred purpose of erecting a monument to the memory of the soldiers of said county who died in the service of their country during the great rebellion.” The monument was completed in October 1871, with the dedication and unveiling taking place on Oct. 17, 1871 with an estimated 2,500 people in attendance.